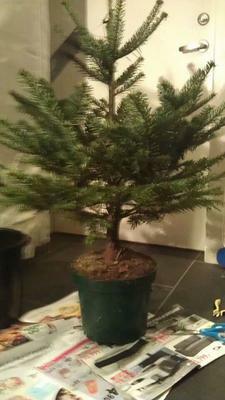 I bougth this tree in a shop grown from nursery for about 3 years. 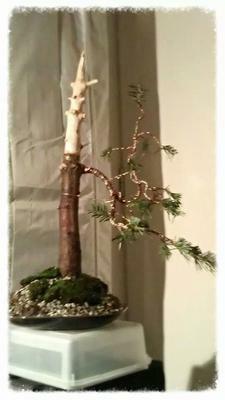 It is commonly sold as decarating tree for Christmas but I decided to go beyond the usual function of this tree and turning it to a bonsai instead. The trunk is interesting with 2 inches diameter essential material for this kind of hobby but most of the branches are too thick, kinda hard to bend. 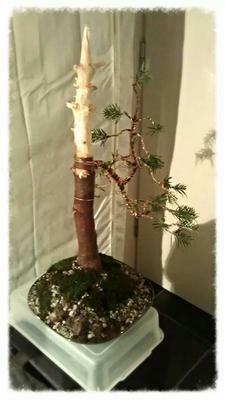 I cut most of its branch which looks sluggish to me and i dont have the tools to work on them. I peel the thick trunk on the uppermost part of the trunk to create a Shari/deadwood and tapered the tip to enhance the shape. The deadwood represents the effect of high altitude falling rock or avalanche that hit the tree.